Located at mile 124, Hancock makes a great overnight stop when using the three or six day trip options. A Super 8 Motel is within a half mile of the towpath, and Cohill Manor B&B is about 1 mile west of town on Route 144. There are also several restaurants in town. Other points of interest in this section include the Tonoloway Creek Aqueduct ruins, and the Round Top Cement Company ruins. 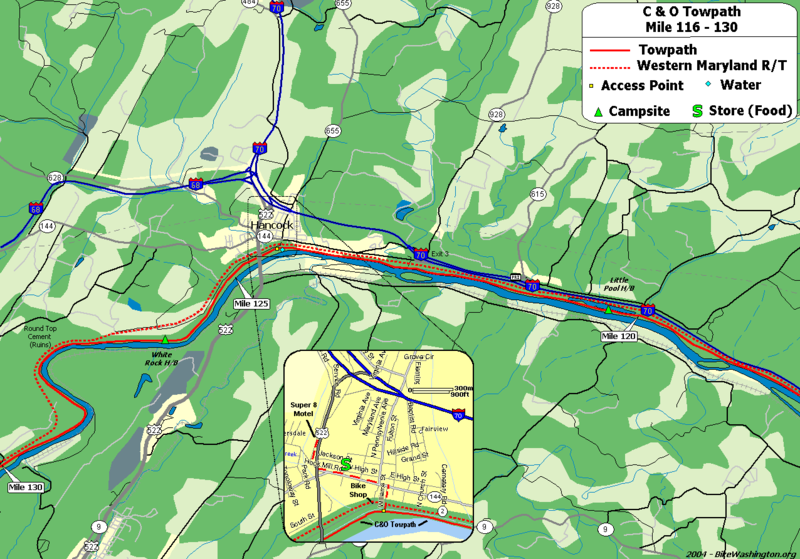 The new Western Maryland Rail Trail runs parallel to the towpath between Hancock and Fort Frederick. Mile 124.1: Hancock, MD - about a 1-1/2 hour drive from the Washington Beltway. Use Exit 3, Route 144. Follow Road about 1 mile to downtown Hancock.